A Beach Train is available for your family fun vacation. The beds are very comfortable ....Two bedrooms have queens one bedroom has a king and a day bed. Perfect if your little one wants to sleep in the room with you. One of the Queen rooms had a fire place and a small tv with a DVD player. The other queen room has a tv with a dvd player built into it. There are several movies to choose from. The living room has a 55 inch tv with cable. 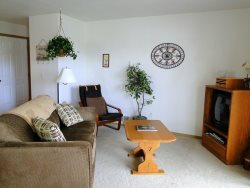 It also has a very comfortable leather couch that has a an electric recliner on each end. A third recliner is also in the living room. There is a Smaller fridge, Microwave , small sink, and coffee pot only there is not a kitchen in the train. You can rent the train and cabooses for the same dates just mention the special rate of $225 a night in the comments, cleaning fees apply. There is a Koi pond, with a water fall and a fire pit beside it. Also picnic tables and chairs on the deck. We no longer provide a bbq as it was abused and destroyed to often. But the fire pit is fun for hotdogs and s’mores. The Train sits at the end of a very quiet paved road and kids will love to bring there bikes as there is lots of room to ride. The path to the ocean is beautifully trimmed so you feel like you are walking through an enchanted forest. In a few feet you are in the dune grass and right on the beach. The walk is just 10 minutes and you can spend hours on the beach while just walking back to the Train to retrieve what ever you forgot the first time.In the rainy season the dunes have water in them but you can access the beach right down the street at the State park. Very fast to get back and answer questions. Friendly individual at rental business building. The train was pretty cool. I didn't realize that there is also a caboose attached that must be another rental so maybe possibility for multiple families in the one area, but outside porches are nice and large and have a water feature. Train is bigger than expected and has comfy beds. The bathrooms are large. Only thing lacking is a kitchen area. A table would be nice so maybe bring a food out one if ya got it :) My son loved it and it is easy access to the beach!! Everyone was helpful, kind, and informative.We were visiting from out of town and were able to answer all of the questions we had regarding local happenings and news. Staying at the Beach Train was awesome and perfect for our 7 guest girls weekend. The rental staff was awesome when we showed up 3 hours laters than we had planned. The train is a short distance to Ocean Shores but located next to a convenient store in the event you forgot something. It was quiet, relaxing, and quirky. Thanks for hosting! Prompt replies that clarified any questions I had! I had an amazing time at the beach train house! It was truly a stunning place and being in the train was just too much fun. Great, comfy beds and a great DVD selection!